I feel like this is something I should watch once a week to remind myself not to get caught up in the minutia of daily life. I bought their manifesto poster a few years ago and have it hanging in my office somewhere, or maybe in someone else’s office, either way I haven’t looked at it in a while. I was reading an article this morning on Good which reminded me of them and I watched their manifesto video and fell in love with it all over again. If you haven’t heard of Holstee, this might be a nice little hug to give yourself this morning. Holstee was started in 2009 during the recession by two brothers Mike and Dave and their partner, Fabian started Holstee. More than a company, or clothes, the trio wanted to create a lifestyle. Starting in the summer of 2009 they dove head first into the world of design and production. After six months and a huge learning curve, Holstee launched its first line of Recycled Tees made of 100% recycled plastic bottles that were milled, cut and sewn within 150 miles of each other in North Carolina. Starting with this first round, 10% of all sales were lent to entrepreneurs in extreme poverty through non-profit micro-lending organizations like Kiva.org – a tradition they are proud to still embrace. Starting out as a side project, the guys realised that they wanted to create more than just t-shirts. Having all quit their jobs and filled with a ton of raw energy, emotion, and ideas – a feeling that they never wanted to forget, they wrote down exactly what was on their minds and the tips of their tongues. It wasn’t about shirts and it wasn’t about their old jobs. It was about what they wanted from life and how to create a company that breathes that passion into the world everyday. It was a reminder of what we live for. 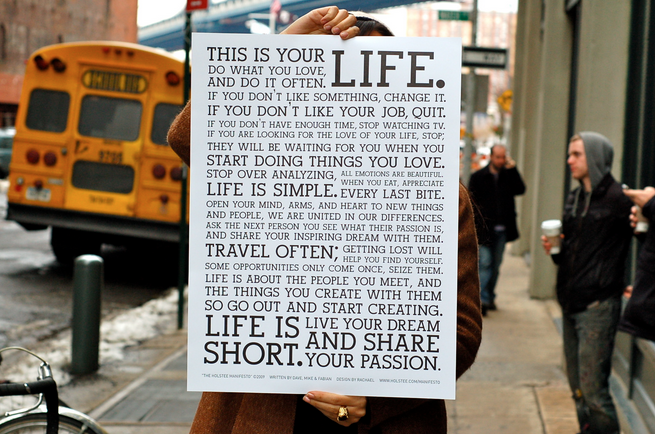 The result became known as the Holstee Manifesto. Whether you’re a believer or not, do yourself a favour. Turn off your iPhone. Shut down your email. Close your office door. Take a moment and watch. Whether you’re a cynic or not, sometimes it’s good to remind ourselves of the things we should be prioritizing in our lives. Even if the people doing the reminding are still trying to sell us something.I’m buying.